Gastonia is the largest city and county seat of Gaston County, North Carolina, United States. It is also the third largest suburb of the Charlotte Area, behind Concord and Rock Hill. The population was 71,059 as of 2010 (35% of the population of Gaston County)1. It is part of the Charlotte metropolitan area, officially designated the Charlotte-Concord-Rock Hill Metropolitan Statistical Area (MSA). Gastonia has experienced steady growth, with a population increase between 2000 and 2010 (according the US Census Bureau) of nearly 8.2%. Gastonia is located at 35°15′19″N 81°10′49″W﻿ / ﻿35.25528, -81.18028 (35.255220, -81.180249). at the geographic center of Gaston County. According to the United States Census Bureau, the city has a total area of 46.3 square miles (119.8 km²), of which, 46.1 square miles (119.3 km²) of it is land and 0.2 square miles (0.5 km²) of it (0.43%) is water. It occupies 13% of the total area of Gaston County. As of 2010, there were 71,059 people, 25,945 households, and 17,720 families residing in the city. The population density was 1,438.9 people per square mile (555.6/km²). There were 27,857 housing units at an average density of 604.8 per square mile (233.5/km²). The racial composition of the city was: 70.18% White, 25.62% Black or African American, 5.45% Hispanic or Latino American, 1.17% Asian American, 0.21% Native American, 0.03% Native Hawaiian or Other Pacific Islander, 1.76% some other race, and 1.04% two or more races. There were 25,945 households out of which 30.6% had children under the age of 18 living with them, 47.3% were married couples living together, 16.3% had a female householder with no husband present, and 31.7% were non-families. 26.5% of all households were made up of individuals and 9.8% had someone living alone who was 65 years of age or older. The average household size was 2.50 and the average family size was 3.00. In the city the population was spread out with 25.0% under the age of 18, 8.8% from 18 to 24, 30.5% from 25 to 44, 22.0% from 45 to 64, and 13.8% who were 65 years of age or older. The median age was 36 years. For every 100 females there were 89.6 males. For every 100 females age 18 and over, there were 86.5 males. The median income for a household in the city was $36,924, and the median income for a family was $44,873. Males had a median income of $33,215 versus $24,173 for females. The per capita income for the city was $19,592. 15.0% of the population and 11.8% of families were below the poverty line. 21.2% of those under the and 12.8% of those 65 and older were living below the poverty line. Many shutdowns and job losses have plagued Gastonia over the past decade. Gastonia maintains a relatively strong manufacturing workforce but many workers are laid off and many more are facing job losses. The city was the international corporate headquarters for textile company Parkdale Mills, the number one manufacturer of spun yarn in the world. The company also operated two production facilities in Gastonia and several in surrounding communities. Parkdale, like many other companies, has closed plants and moved production to other countries. Other manufacturers in Gastonia include Wix Filtration Corp., Freightliner LLC, Stabilus, Danaher Tool Group (Easco Hand Tools), and Curtiss-Wright Controls Engineered Systems and Radici Group. Other major employers include the City of Gastonia and Gaston County governments, the Gaston County Schools system, Caromont Healthcare (Gaston Memorial Hospital), and retailers Walmart and Advance Auto Parts, with two and six stores (plus a distribution center) respectively. Police force: Gastonia and Gaston County are home of one of two county police forces within the State of North Carolina, the Gaston County Police Department. The other county police force in NC is the Charlotte-Mecklenburg Police in neighboring Mecklenburg County. Other forces include City of Gastonia Police Department and the Gaston County Sheriff's Office. The Sheriff's Office holds two of only 25 bomb/drug dogs in North Carolina. Fire/Rescue: The Gastonia Fire Department houses over 16 engines including ladder units, quints, and pumpers. Gastonia also has a strong rural fire department which is headed by volunteers. Public works: This includes road maintenance and sanitation as well as DWP (department of water and power) to the city. The Schiele Museum of Natural History is east of downtown on Garrison Boulevard. The Gaston-Lincoln Regional Library System's main library is across the street from the museum. The Daniel Stowe Botanical Garden is located just southeast of the city on NC 279. The U.S. National Whitewater Center (on the Catawba River) is east of the city in neighboring Mecklenburg County, NC. Southpark Mall in Charlotte, NC is 45 minutes away. The Northlake Mall, also in Charlotte, is about 20 minutes away. Gastonia and Gaston County have a varied topography, with the maximum elevations of 1,690 feet (King's Pinnacle) and 1,625 (Crowder's Mountain) both in the Crowders Mountain State Park. The park is located just a few miles from Downtown Gastonia and the peaks are popular destinations for outdoor enthusiasts of the Carolinas. These peaks are the highest elevations in the Charlotte-Gastonia-Rock Hill Metropolitan Statistical Area. A few smaller mountains are located at the periphery of the city. Gastonia is known for its abundance of churches, primarily Baptist and Methodist. NBA star Eric "Sleepy" Floyd, who attended Hunter Huss High School. Musician Fred Durst (nu metal group Limp Bizkit), who attended Hunter Huss High School. Televangelist Ernest Angley, who was born in Gastonia and grew up in the surrounding area. All public K–12 schools in Gaston County, including the city of Gastonia, are part of the Gaston County Schools (GCS). GCS operates schools at the elementary, middle, and high school levels. There are 10 public high schools in Gaston County--Ashbrook High School, Forestview High School, Hunter Huss High School, East Gaston High School, North Gaston High School, South Point High School, Cherryville High School, Bessemer City High School, and the Highland School of Technology. Private schools are also available in the city. Gaston Day School, Gaston Christian School and First Assembly Christian Academy (FACA) are among various private schools offered in the Gastonia area. Gastonia also has a charter school, Piedmont Community Charter School, that serves K–12 grade students. Although there are no colleges or universities within the city limits of Gastonia, higher education is well represented in the greater Gastonia area. Gaston County is home to Belmont Abbey College (Belmont; 4-year) and Gaston College (Dallas, Lincolnton (Lincoln County), and Belmont; 2-year). Gotha was Gastonia's first sister city in 1994. Santiago de Surco became an official partner in March 2004. Mayor Jenny Stultz visited Gotha in 2007. In December 2007, the mayor of Santiago de Surco visited for the annual lighting of the Christmas tree in the Rotary Pavilion. He was invited to light the tree along with one of the town's councilmen. Franklin Square is another one of Gastonia's premier shopping centers. The complex is divided into three Phases. Phase I features a Wal-Mart (one of two in the city), Best Buy, Ross Dress for Less, and Michaels. Phase II is home to Kmart, Lowe's Home Improvement Warehouse, and Sam's Club. Phase III is where Kohl's, Old Navy, Books-A-Million, Sports Authority, BERNINA dealer SewMuchFun! and a 14-screen movie theater is located. There are also many more shopping centers across the city with other well-known national and local retailers. The Gastonia Grizzlies play baseball at Sims Legion Park. The team is part of the Coastal Plain League (CPL) featuring players at the collegiate level. The season runs from the end of May to August. The Gastonia Gargoyles play rugby at Gaston County's North Belmont Park. The team is part of the North Carolina Rugby Union (NCRU) and plays Division III men's rugby. The club plays in the fall (August - November) and spring (Feb - May) seasons. The club also hosts an annual rugby 7's tournament in Clover, SC during the Clover Scottish Games on the first Saturday in June. Interstate 85 (I-85) links Gastonia directly with Charlotte, Greensboro, Durham, and Petersburg/Richmond (to the north) and Spartanburg, Greenville, Atlanta and Montgomery (to the south). Gastonia's transportation network is supplemented by one additional freeway (US 321), the freeway portion of which directly connects Gastonia with transcontinental I-40 and the city of Hickory, North Carolina, which is 35 miles north of Gastonia. An additional limited-access highway, the toll Garden Parkway is planned as a loop that would encircle Gastonia to the west, while also adding a direct southeastern connection to Charlotte, I-485 and the Charlotte/Douglas International Airport. Gastonia is also served by three US highways: US 29; US 74 (US 29 and 74 are multiplexed together through Gaston County); and US 321. US 29 parallels I-85 through the Carolinas; while US 74 provides direct east-west links to Charlotte and Wilmington (east), and Asheville and Cherokee (to the west). US 321 links Gastonia to central South Carolina and the Blue Ridge Mountains in northwest North Carolina. State highways NC 7, NC 274, NC 275 and NC 279 also traverse Gastonia. Franklin Blvd., Garrison Blvd., Hudson Blvd., and Ozark/Long/Airline/Gaston Aves. are major east-west city thoroughfares. New Hope Rd., Chester St./York Rd., and Marietta St., are major north-south city thoroughfares. Gastonia Transit (GT) is Gastonia's city transit provider. The bus service operates on a fixed-route system covering most of the city. GT has a new fleet of seven buses and stops are clearly visible around town. Buses run Monday-Saturday, and transfer downtown Gastonia at the Bradley Station. Regular fare is $1.00, transfers are free. Charlotte Area Transit System (CATS) is Gastonia's commuter provider to Charlotte. The Gastonia Express (Route 85X) offers Monday-Friday bus service to/from uptown Charlotte, via the Bradley Station. One-way fare to/from uptown Charlotte: $3.00; transfer is free when transferring to any other CATS services. Amtrak Crescent (trains 19, 20) connects Gastonia (GAS) with the cities of (to the north) New York, Philadelphia, Baltimore, Washington, Charlotte, and (to the south) Atlanta, Birmingham, New Orleans. The unmanned Amtrak station is situated at 350 Hancock Street. The Gastonia area is served by two airports. The Gastonia Municipal Airport (AKH) handles most of the city's private air service needs. It is located in the southeast part of the city, off NC 274. The Charlotte/Douglas International Airport (CLT) provides Gastonia with a major domestic/international gateway and is located 18 miles east of Gastonia in Charlotte. 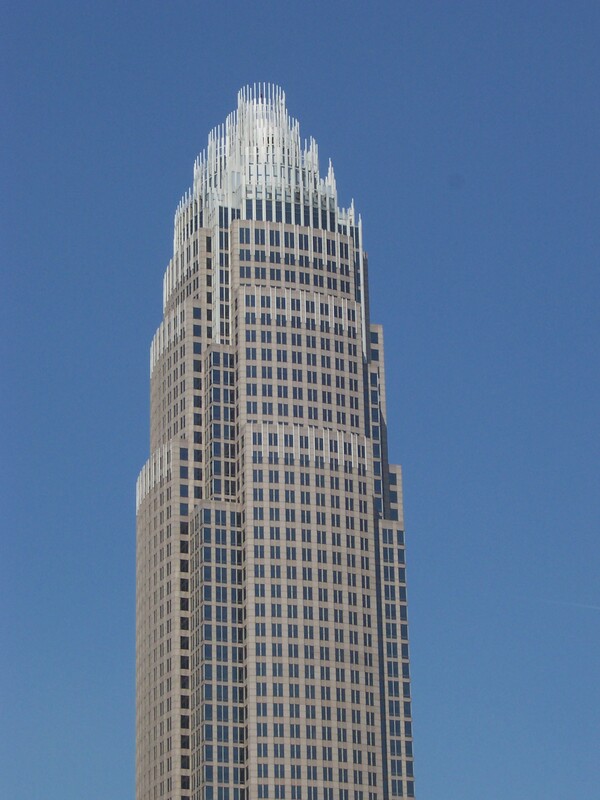 CLT is US Airways largest airline hub. ^ Gaston County Employers - 4th Quarter 2007. Retrieved on 2008-07-29. Gastonia, North Carolina Demographics and maps. This page uses content from the English language Wikipedia. The original content was at Gastonia, North Carolina. The list of authors can be seen in the page history. As with this Familypedia wiki, the content of Wikipedia is available under the Creative Commons License.